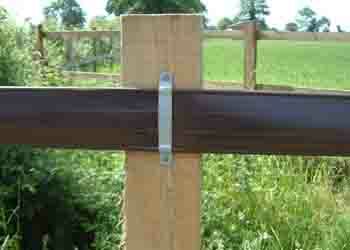 Studrail is a strong plastic horse fencing designed to replace wooden rails. This type of fencing benefits from no crib biting, reduced maintenance, a clean and tidy appearance, no corrosion and peace of mind. Studrail fencing keeps your horses safe. Orders over £125.00 are delivered free of charge Great Britain. Normal delivery is by carrier and takes three days from receipt of payment. All cheques must be cleared before despatch. There is a £10.00 delivery charge on orders under £125.00. There is an overnight delivery charge of £6.00 per roll.